An exciting self-drive vacation taking you from the spirited city of Montevideo with its splendid historic quarter, all the way to the charming coastal town of Jose Ignacio. Before setting off in your vehicle you’ll first explore the historic and alluring town of Colonia. Best known for its cobbled, World Heritage-listed old town, a walking tour will reveal just how much of the old Portuguese and Spanish architecture has been wonderfully preserved. You’ll then pick up your hire car and drive to Montevideo where you’ll be taken on a tour of the old city and its museums and monuments. Back on the road, you’ll stop at the olive plantations of “Lote 8” before continuing east to the laidback resort town of Jose Ignacio. Just a short drive from lively Punta del Este, you’ll enjoy direct access to the beautiful sandy beach. international and domestic flights, airport taxes, hire car, park fees and bed & breakfast at Plaza Mayor, Don Boutique and Casa Suaya. Based on two people travelling. Catch a flight from London to Montevideo, via Madrid, arriving the following morning. You will be met at the airport and driven two hours to your hotel in Colonia del Sacramento. You will find yourself ideally situated in the town’s historic quarter, just steps from the old lighthouse. Dating back to 1680 when it was founded by the Portuguese, the old town has since been declared a UNESCO World Heritage Site and is renowned for its quaint cobbled streets, colourful colonial buildings, bars and restaurants. Enjoy a walking tour in the afternoon, stopping by the old buildings, forts and Spanish and Portuguese museums. Today, after breakfast, you will be given the keys to your hire car and make the drive to Montevideo. 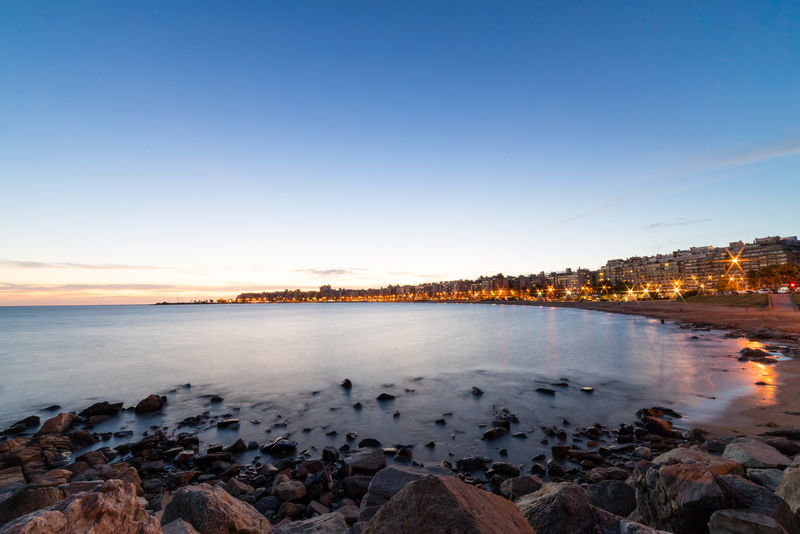 Divided between the old city, new city and open city, Montevideo is an intriguing yet modern metropolis framed entirely by a white sanded beach. A guided walking tour will introduce you to the old city – dating back to colonial times – where you will discover the famous Port Market, Carnival Museum, Museum of Pre-Columbian Art, Solis Theatre and renowned Torres Garcia Art Museum. You’ll see the Cathedral and Cabildo in Constitution Square, before ending at the gates of the old city where the statue of national hero “Jose Gervasio Artigas” is located next to his mausoleum. Today you will follow the scenic Routes 8 and 12 towards the olive plantations of “Lot 8” where you will enjoy a tasting and learn all about the elaborate production process of olive oil. You then continue your drive to beautiful Viña Eden where you will stop for lunch and another tasting before continuing east to your hotel. You will be staying in a modern, beachfront property a short drive from the centre of Punta del Este. As well as having an array of outdoor activities at your fingertips – including hiking, windsurfing and horseback riding – you will enjoy direct access to the sandy Jose Ignacio Beach. Today, after breakfast, you will drive back to Montevideo, dropping your hire car off at the airport. You’ll board an afternoon flight back to London via Madrid, arriving the following morning. Catherine was so friendly, helpful & efficient that right from the start we felt our vacation was being well organized.